Since I am now getting error (80710D36) when I try to enter the Playstation Store, I can't see the current options. Therefore I go to the news feed and select the new DLC button to get in the store that way. So far the store has been sooooo bogged down I haven't been able to download anything. The closest I've gotten is where the store item has the shopping bag icon showing it's now in my content folder. The first stop is to browse over to the Playstation Plus area and select the free 30 day item from the menu. Next you will want to download all the "free" items thanks to the PS Plus subscription. This includes awesome games like Comet Crash and Sonic 2. You will see a lot of the games and content in the Playstation Plus part of the menu but do take a look for other free DLC like the new Socom ones. I'm going to download the Killzone 3 map pack since it is made free by PS Plus and it should still be around when my free subscription runes out. You can also play any of the 60 minute full game trials though I see this more as an extended demo session. I mean the normal demo of Infamous 2 probably lasted me 45 minutes and was an extremely long demo. Kuddos to Sucker Punch for giving me a boss fight and allowing me to see the Uncharted engine in action. I'm personally choosing Dead Nation and Wipeout HD when I can download the free games. I already own LittleBigPlanet and have already played through my friend's copy of Infamous. I also already own the excellent Super Stardust HD. To get the best value from your free games, I would suggest picking Infamous and Wipeout HD if you don't already own these. Now here is the goldmine ready for you to start blasting away with dynamite. Simply browse through all the dynamic and premium themes and look for the ones which are now free thanks to PS Plus. The first theme that comes to mind is the Playstation Plus theme since it makes perfect sense. Of course go for the popular dynamic themes like the fire log and fishtank. Go to the avatar section of the store and download all the premium avatars which are now free thanks again to Playstation Plus. I can't get to that menu area due to the errors and no content showing up, so please explore on your own leisure. The final thing to do is to go through your super long list of saved games and choose to add them to Sony's saved game cloud server. There doesn't appear to be a quick way to just select all your games and throw them on the server. So I would suggest backing up the saves which are locked or saves which are extremely valuable (I'm looking at you Mercenaries 2 and Resident Evil 5). Make use of the save backup so if for some reason you lose the saves, all it takes is a month subscription to Playstation Plus to recover your saves. As someone who has spent hundreds of hours gaming, I protect my saved game files because I can never get that time back. Whenever you can get on the Playstation Store, make sure to go crazy downloading all the free content and games on the PS3 and PSP. With Sony getting hacked again, this time on their Sony Pictures website, it's going to be a rough fifty years of cyberwarfare between corporations and legions of hackers. I guess I'll be on the sideline enjoying my personal 3D gaming system created by SoNinSoft. You can also grab the "100" free items for Home. There are two free estates and tons of clothing for both your male and female characters. The Home store interface is still just as laggy and errorprone for me on a Saturday (June 4th). The "Welcome Back Program" is now active …THIS IS GREAT NEWS!…Your posts are always worth reading,so helpful and informative! keep updating us always! Wow these are amazing games to give out for free! I thought it would just be cheap minis like angry birds or something throw away like that!!!! 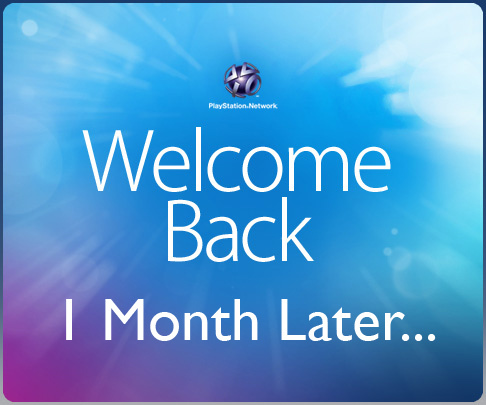 Playstation Network is all again set at it's original speed, so now is the day when you grab a tissue and wipe away the tears.